Although known in the community as BICAS (Bicycle Inter-Community Art and Salvage), our official name is Bootstraps to Share of Tucson. Our primary project (and in many years our only project) is the community bicycle education center known as BICAS. The early history of Bootstraps, which led organically to the forming of our BICAS project, is given below. Bootstraps to Share had its origins as a group of loosely affiliated individuals in Tucson who drew inspiration from the international Bikes Not Bombs movement. That movement was originally dedicated to providing sustainable, human-powered transportation to communities in developing countries by setting up, in those countries, local community bicycle maintenance spaces and training local bike mechanics, the key idea being the establishment of local self-reliance; but similar needs were soon identified within the U.S. itself, particularly in the inner cities. The precise date of the forming of the Tucson affiliation remains murky. According to a Bootstraps grant application from 21Oct1995, our Bikes Not Bombs chapter formed in 1983. However, according to histories of Bikes Not Bombs in Massachussetts, they started around 1984 with a purely international focus, and only around 1987 developed similar programs for their local community, subsequently starting about a dozen similar organizations around the United States. (Since their history doesn’t give details, it remains unclear whether the Tucson group was merely inspired by Bikes Not Bombs or was an official chapter of Bikes Not Bombs.) All we can say for certain is that folks in Tucson in the mid 1980s wanted to accomplish something similar. Bootstraps to Share was incorporated in October 1989 as a non-profit corporation in the State of Arizona. (The non-profit nature was further clarified, in an October 1990 amendment to the Articles of Incorporation, to conform to requirements of federal law, and we obtained federal tax-exempt status as a 501(c)(3) organization in December 1990. Arizona tax-exempt status was obtained in April 1991.) You can read our Articles of Incorporation, and learn more about our tax-exempt status. In forming Bootstraps to Share, the founders diverged somewhat from their Bikes Not Bombs roots, laying out an ambitious vision of addressing many social issues simultaneously, principally helping homeless individuals obtain housing and income, the latter by employing said individuals in various capacities, such as repairing houses and bicycles. One of the original incorporators, and actively involved in the organization until 2000, was Kathe B. Padilla, who has started other non-profit organizations, notably Women for Sustainable Technologies and Zambian Children’s Fund. Bootstraps to Share is a new organization located in Tucson which creates employment for the homeless and at the same time helps them get a place of their own in which to live. For a longer description, see the application for federal tax-exempt status (especially the last two pages). The word “bicycle”, which is today perhaps the one word associated most with BICAS, is mostly absent from the early documents. It is evident that the founders of Bootstraps had bicycle-related projects in mind, but perhaps as an experiment, and perhaps mostly as a means of earning income for the homeless, rather than an end in itself. For example, the proposed budgets in our federal application do mention “bicycle shop”, but this merely meant the project idea of having homeless individuals earn money by repairing bicycles and building custom bicycle trailers from scrap metal (see our response to an IRS query during the application process). Create cottage industries to employ homeless people through the selling and repair of used bicycles; sell used parts; manufacture bicycle trailers from scrap materials. Create cottage industries to employ and empower homeless and working poor. Recycle used bicycles, sell to the public, ship ([as a form of] humanitarian aid) to developing countries. 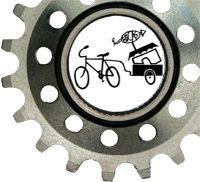 Run bike repair programs for at-risk youth; recycle bicycles from the community into our youth programs, to homeless persons, and to developing countries; promote the use of alternative transportation in Tucson; teach bike mechanics. In particular, this statement indicates the organization to have picked up an additional focus on youth; indeed, our Articles of Incorporation were amended in August 1994 to increase the scope of the organization beyond the homeless to also include youths, emphasizing youth education, and specifically mentioning human powered transportation. Kim Young, who had worked for Bikes Not Bombs in Nicaragua in the late 1980s, got involved in Bootstraps around August 1994 and remained involved until approximately June 2002. During this time she was the principal source of energy and leadership and was officially designated the Director (later co-director with Allen Reilley and Mark Gifford). As mentioned in an Arizona Daily Star article on 05Apr1996, the organization started using the name BICAS in early 1996, and Kim Young’s efforts (and later that of Allen Reilley and Mark Gifford) led to increased public participation (particularly youth participation) and thus visibility. As a testament to her leadership, and for establishing the foundation for what BICAS has become today, we often credit Kim Young as the founder of BICAS; nonetheless, we should not forget that the parent organization Bootstraps came into existence many years prior, under the leadership of Kathe Padilla. The original location of Bootstraps seems to have been Kathe Padilla’s residence. At the time the name “BICAS” came into usage (around April 1996) the location of BICAS was Kim Young’s artist warehouse. By July 1997 BICAS had moved to its current location at 44 W. 6th St. The original entrance to the basement was through a side window. BICAS was truly “underground”, both figuratively and literally, and the youth bicycle programs were known as the “Youth Bike Underground”. The old entrance is shown in the 1997 video 6th Street and the Tracks, which you can access on our youtube channel. That video also includes interviews with Kim Young and Allen Reilley, among others. Bootstraps is essentially indistinguishable from BICAS. But sometimes there is staff interest in other activities that fit under the rubric of the Bootstraps Articles of Incorporation, and this sometimes leads to a new project, distinct from BICAS, but part of Bootstraps (at least initially until the project gains financial independence and independent legal existence). Examples include the Union of Art and Healing Local No. 8, the El Grupo Youth Cycling Club, and Cyclovia. Our website got started in 2001 and has been overhauled a few times since then. Our website archive(coming soon) shows earlier incarnations of the BICAS website. The operation of BICAS has remained fairly unchanged since Kim Young’s involvement. Naturally the energy and involvement in particular BICAS programs will wax and wane depending on public participation as well as staff interest, lending an evolving character to the organization, but Bootstraps found a niche with the bicycle recycling and education center known as BICAS, fulfilling an important and recognized role in the Tucson community. We expect this project to remain relevant for a long time to come. After all, we’re helping people, and having fun doing so. What could be better?